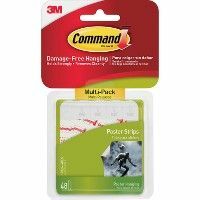 Command Poster Strips Value Pack make decorating quick and easy. They're perfect for hanging schedules, posters, calendars and pictures without frames, or as an alternative to double-sided tape. They stick to wood, tile, metal and painted surfaces yet they also come off, leaving behind no holes, marks, sticky residue or stains.